The United Nations says it is working with Egypt to broker an end to the latest round of fighting in Gaza. The office of the U.N.'s Mideast envoy, Nickolay Mladenov, said Monday that efforts were underway "to ensure that Gaza steps back from the brink." It called for an end to rocket fire, and for restraint "by all." An Israeli airstrike has hit Hamas' Al-Aqsa TV station in the Gaza Strip. The station went off the air after the airstrike. Minutes earlier, it had halted its programming and was broadcasting a still image of its logo after the building was hit by a warning missile. Shortly after, three loud explosions were heard and the screen turned black. Witnesses say the blast destroyed the entire building, and explosions illuminated the night sky. Workers evacuated the building after the warning shots. It was not clear whether there were any casualties. Israel's military says it is prepared to step up its efforts against Palestinian militants in the Gaza Strip if rocket fire at Israel continues. Lt. Col. Jonathan Conricus, a military spokesman, said Monday that Israel has boosted forces near the Gaza border with additional infantry troops, defensive systems and intelligence units. Conricus told reporters that the army has so far struck more than 30 targets belonging to the Palestinian militant groups Hamas and Islamic Jihad. He says some 200 rockets have struck Israel in the past three hours. He says Hamas is "bringing destruction upon the Gaza Strip." Palestinian health officials say Israeli airstrikes in the northern Gaza Strip have killed two people and wounded another three. It was not immediately clear if the casualties were militants or civilians. Health officials said they were all men in their 20s. Israel launched the airstrikes on Monday in response to an intense barrage of rocket fire from Gaza. The rocket attack from Gaza appeared to be an act of revenge after a botched Israeli raid the day before killed seven Palestinian militants. Israeli Prime Minister Benjamin Netanyahu was meeting with his military chief and defense minister late Monday. The Israeli military says it has dispatched fighter jets to strike "terror targets" throughout Gaza following a barrage of mortar and rocket fire that wounded six people. 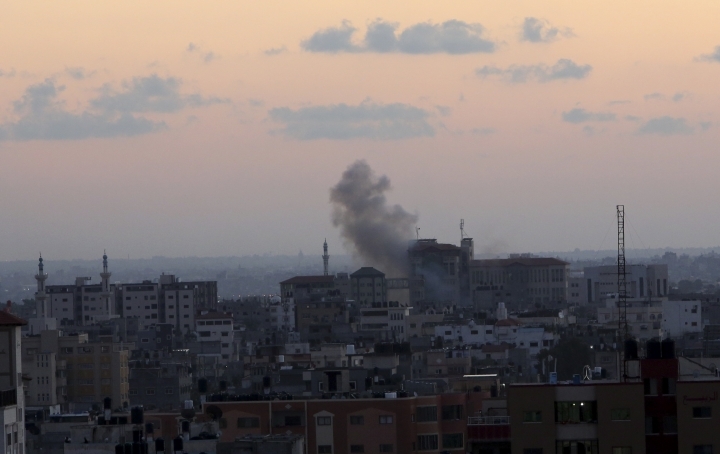 Gaza's Hamas rulers and the smaller Islamic Jihad group claimed joint responsibility for the rocket barrage. Israeli medics say a 19-year-old man has been critically wounded in an explosion in southern Israel. The man apparently sustained the wounds in a Palestinian mortar attack from Gaza that struck a bus. Black smoke could be seen billowing into the air from the area of the mortar strike. The incoming fire comes a day after an Israeli undercover military raid in Gaza sparked fighting that left seven Palestinian militants and an Israeli officer dead. The Israeli military says a bus has been hit by fire from the Gaza Strip as air raid sirens sound throughout southern Israel. There were no immediate details on injuries from Monday's strike on the Israeli bus. Rockets could be seen being launched out of Gaza toward Israel, and Israel's Iron Dome rocket defense system was heard deploying. The Israeli military says an officer was killed and another was moderately wounded during an operation in southeast Gaza Strip, involving an exchange of gunfire. Earlier, Hamas' armed wing, the Qassam Brigades, said Israeli undercover forces in a civilian vehicle infiltrated 3 kilometers, about 2 miles, into Gaza on Sunday and fatally shot Nour el-Deen Baraka, its local commander in Khan Younis town.